Shakespeare: Never play with the feelings of others because you may win the game but the risk is that you will surely lose the person for a life time. Napoleon: The world suffers a lot. Not because of the violence of bad people. But because of the silence of good people. Einstein: I am thankful to all those who said NO to me. It’s because of them I did it myself. 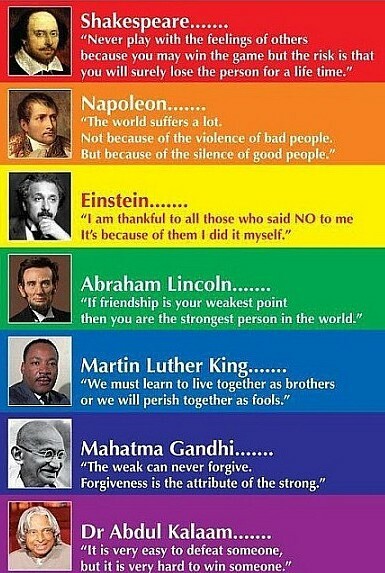 Abraham Lincoln: If friendship is your weakest point then you are the strongest person in the world. Martin Luther King: We must learn to live together as brothers or we will perish together as fools. Dr Abdul Kalaam: It is very easy to defeat someone, but it is very hard to win someone.